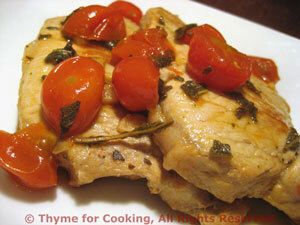 Savory Pork Chops with Tomato and Sage, Thyme for Cooking main course. Finely chop garlic and roughly chop tomato. Add garlic and sage to pan and sauté 1 minute. Add wine, stock and tomato. Bring to a boil, reduce the heat to low and simmer about 5 minutes until mixture starts to thicken. Return pork chops to pan, turning once to coat with sauce, and cover. Let simmer 5 - 10 minutes until done. Arrange chops on small platter or plate, pour sauce over and serve.